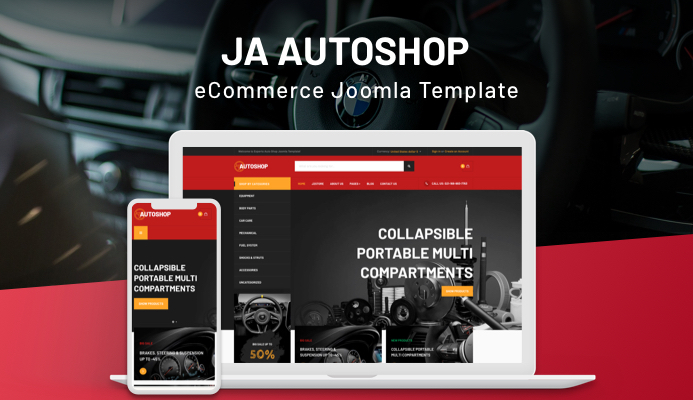 JA Autoshop - All in one eCommerce Joomla template is available for download. In this blog post, we will discuss the core features of eCommerce Joomla template with screenshots. JA Autoshop template designed for Auto spare parts, automobile accessories, auto tools to complete a shoppping cart theme experience. The responsive Joomla template comes with 4 different color themes Default, Orange, Green and Blue, thanks to multiple theme colors support and super flexible layout system. The Autoshop template integrates eCommerce Joomla eCommerce extensions: Virtuemart and J2Store. JA Autoshop is based on powerful T3 Framework, Bootstrap3 comes with creative design along with all required pages & functions for a eCommerce website.